You are buying Abbott Similac Advance w/Iron Concentrate Retail 13oz Each, model #56973. ADW Diabetes offers a complete line of baby formula both in liquid and powder form. The Abbott Similac Advance with Iron Concentrate Retail 13oz baby formula provides the balance of protein, minerals, and other nutrients that helps give babies a strong start in life. 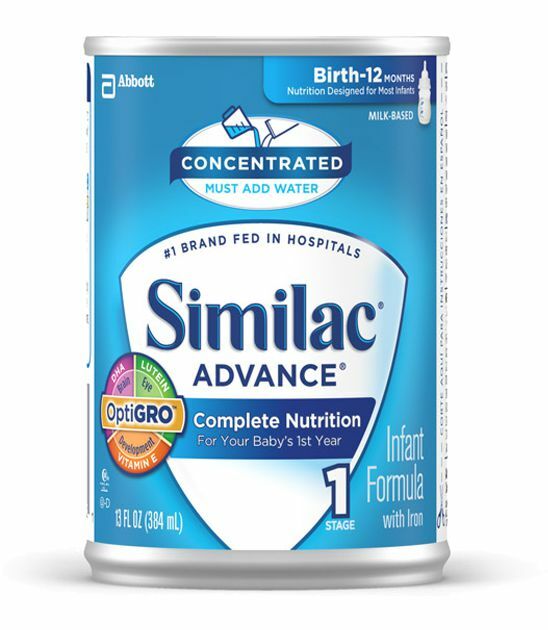 With a well-documented heritage of innovation, Similac formulas have been developed with leading scientists and more than 280 clinical studies. Abbott Similac Advanced is a nutritionally complete, milk-based, iron-fortified infant formula for use as a supplement or alternative to breastfeeding. OptiGRO is an exclusive blend of DHA, lutein and vitamin E: these important ingredients are found in breastmilk. Clinically proven tolerance in newborns and proven immune outcomes. Similac Advance has been clinically shown to support greater calcium absorption for strong bones. Water, Nonfat Milk, Lactose, High Oleic Safflower Oil, Soy Oil, Coconut Oil, Galactooligosaccharides, Whey Protein Concentrate. Less than 1% of the Following: C. Cohnii Oil, M. Alpina Oil, Beta-Carotene, Lutein, Lycopene, Ascorbic Acid, Calcium Carbonate, Potassium Citrate, Soy Lecithin, Monoglycerides, Potassium Chloride, Carrageenan, Magnesium Chloride, Ferrous Sulfate, Choline Bitartrate, Choline Chloride, Taurine, Calcium Phosphate, Potassium Phosphate, m-Inositol, Zinc Sulfate, Niacinamide, d-Alpha-Tocopheryl Acetate, Calcium Pantothenate, L-Carnitine, Riboflavin, Vitamin A Palmitate, Cupric Sulfate, Thiamine Chloride Hydrochloride, Pyridoxine Hydrochloride, Folic Acid, Manganese Sulfate, Phylloquinone, Biotin, Sodium Selenate, Vitamin D3, Cyanocobalamin, Salt, Potassium Hydroxide, and Nucleotides (Adenosine 5’-Monophosphate, Cytidine 5’-Monophosphate, Disodium Guanosine 5’-Monophosphate, Disodium Uridine 5’-Monophosphate).